- An out-of-state licensee can receive a commission from Michigan licensee so long as the out-of-state licensee does not conduct any negotiations within the state of Michigan. - It is unclear whether out-of-state licensee is permitted to enter Michigan. 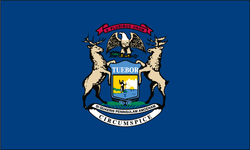 ​- An out-of-state licensee is prohibited from bringing a commission lawsuit in Michigan. Title companies, lenders, real estate agents, and attorneys may conduct closings. Conveyance is by warranty deed which must give the full consideration involved or be accompanied by an affidavit which does. Many transactions involve land contracts. Mortgages are the security instruments. Michigan uses ALTA policies and endorsements. Buyers generally pay closing costs and the lender’s title insurance premium, and sellers pay the state transfer tax and the owner’s title insurance premium. In many tax jurisdictions, taxpayers may opt to pay their taxes in two equal installments without penalty. The rules are very clear in this State that a Business Broker must hold a real estate license to sell a business. (u) "Real estate broker" means an individual or business entity that, with intent to collect or receive a fee, compensation, or valuable consideration, sells or offers for sale, buys or offers to buy, provides or offers to provide market analyses of, lists or offers or attempts to list, or negotiates the purchase, sale, or exchange of real estate; that negotiates the mortgage of real estate; that negotiates for the construction of a building on real estate; that leases or offers or rents or offers for rent real estate or the improvements on the real estate for others, as a whole or partial vocation; that engages in property management as a whole or partial vocation; that sells or offers for sale, buys or offers to buy, leases or offers to lease, or negotiates the purchase or sale or exchange of a business, business opportunity, or the goodwill of an existing business for others; or that, as owner or otherwise, engages in the sale of real estate as a principal vocation.